The Ingenico i7780 credit card machine is a high-speed enabled portable transaction terminal capable of serving a range of up to 300 plus metres (1000 ft.). Up to 7 terminals can operate simultaneously using one communications base, to accept debit, credit and smart card payments at the table, counter or wherever else it may be convenient to serve the customer. Built-in thermal printer, PIN security and a multi-app platform make the Ingenico i7780 credit card terminals perfect for the hospitality organization wishing to speed customer service while adding versatility to their product offerings. Card payments, gift card acceptance, loyalty, prepaid services and more have never been easier to implement than with the Ingenico i7780 credit card machine. 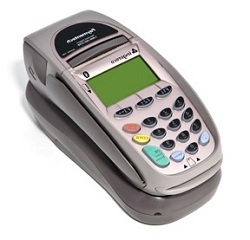 The Ingenico i7780 credit card terminal base is the central hub for multiple wireless i7780's. Up to 7 handset terminals can be connected to a single base through bluetooth and charge each terminal individually.